King of the “Wicked” handstyle, he had a significant influence on The Roots and inspired a character on MTV. Oct. 23, 2018, 9:45 a.m.
Last week, Philadelphia lost a legend. Eliu Nazario — known in his Olney neighborhood and old-school hip-hop lore by his tag name, Karaz — died on Oct. 14 at the age of 51. An architect of the graffiti culture that flourished in Philadelphia from the late ’70s to early ’90s, Karaz was a Renaissance man of street style, music and art. Less interested in fame and money and more enthralled by the concept of “staying fresh,” Karaz was back-and-forth between Philly and NYC for the better part of two decades, on an adventure of finding the next dope outfit, searching for the next twist to add to his signature wall tags and seeking out the next unsigned artist to include in his basement mixtapes. 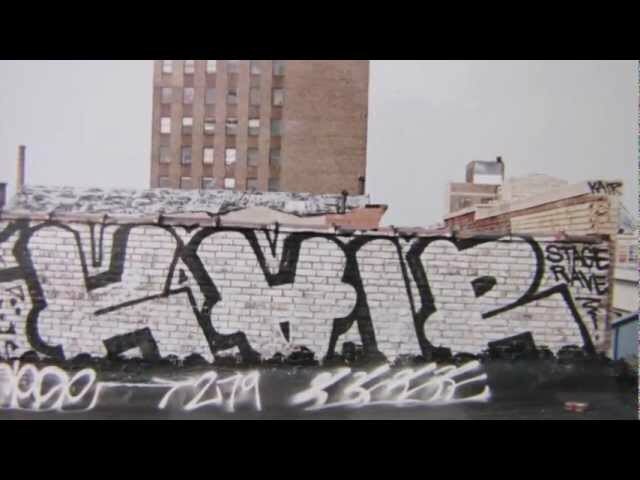 Revered by those in Philly’s early hip-hop movement, Karaz is widely considered to be a street art pioneer, particularly of the “Wicked” graffiti style. For his sister Lucy Nazario, he was also a humble and hardworking man who spent 34 years working as a custodian at Jefferson Hospital to support their mother. Per Nazario, it was her brother’s passing, which came after a long, arduous battle with brain cancer, that led her to finally learn more about his underground fame — such as the fact that he was a significant influence on The Roots, was close friends with Method Man, and inspired a character in an MTV cartoon. Karaz’s decision to remain a low-key giant means there’s little info about his legacy online, but speaking with various friends and family, Billy Penn was able to pull together a remembrance of his vivid life puzzle. Born on March 28, 1967, to Puerto Rican parents as the baby brother of three older siblings, Karaz was doted upon, according to his sister. He began to show an inclination toward the arts — particularly for drawing — at a young age, and there was no way to stop him from displaying that affinity all throughout the house. Per Nazario, her brother was constantly doodling on letters, or pretty much anything that struck his interest. He enjoyed augmenting images by supplementing them with his particular complex linear flavor. By the time he was about 10 or 11 years old, Karaz was already perfecting the Wicked style, and had selected his tag name. According to his peer Culture Livingston (tag name DenSke), the actual originator of the Wicked (also spelled “wicket”) style of graffiti was Notorious Bik, founder of Philly graffiti crew Sly Artistic Masters. Wicked writing, which graffiti.org defines as “exaggerated, cryptic, often elongated versions of the graffiti writer’s tag,” is a frenetic, meticulous and highly-individualized craft. It was also known as “Philly Handstyle” — people say the Philly Wickeds stood out because of their ability to remain consistent in their execution. Robert “Boo” Rosario, one of Karaz’s closest friends — and a member of his graffiti crew since they were in high school painting the alley walls up and down North 5th Street — said Karaz’s reputation led to an invitation to collaborate on an exhibit with Lady Pink, a cult figure who was a trailblazer in feminist Latina street art. Though Mayor Wilson Goode began to crack down hard on graffiti in 1984, with the implementation of the Philadelphia Anti-Graffiti Network, Karaz continued to lead two crews: Hands in Performance and Every Tag Counts. Graffiti culture eventually dropped off in the city, but Karaz was still in deep with the city’s hip-hop scene. Though Karaz was widely known for his graffiti, he was also known for being an extrovert, manifested in music, fashion and witticisms. Per friends, Karaz took part in various parts of hip-hop culture — and excelled in them all. Part of what made him particularly special, noted Livingston, his old friend, was the fact that Karaz was a Latino in the African-American-dominated Philly hip-hop scene. “He was a true embodiment of what it meant to be hip-hop, of what it meant to be the old-school definition of a ‘b-boy’. He was truly a premier arbiter of the culture,” Livingston said. What did it mean to be a connoisseur of ‘the culture’ in the 80s and 90s? South Street, which at the time served as a meeting place for various Philly hip-hop crews based in other neighborhoods, was also the site of the Layup. Per Rosario, the Layup was one of the first hip-hop boutiques of its kind in the city. It sold street fashion, comic books, stickers, mixtapes and albums and all things hip-hop. Because Karaz was an avid collector, the friends often found themselves there on the weekends. It was also on South Street where Karaz became acquainted with Questlove and Black Thought, formerly known as the Square Roots. Per their tribute posts on social media, both artists fondly remember how Karaz would come up to them while they were freestyling for change, strike up a conversation and drop his catchphrase, “okay player” (pronounced okay playaaaaaaaaaaah). The Roots founders loved “okay player” — so much that Questlove went on to create a popular music site and collective called Okayplayer. Moreover, Questlove has Karaz to thank for the “Quest” in his name. Per Questlove himself on Instagram and per Nazario, Karaz was the one that told the drummer to adopt “Questlove” as his stage name, as opposed to the stylized version (?love). Carlito Rodriguez, now a producer of Empire, was so inspired by Karaz that he dedicated a character to him on his first published comic strip — which ran regularly in The Source from 1991 to 1994 — and on his first foray into television: the animated show Station Zero on MTV, which aired for one season in 1999. “All of the other characters on Station Zero were combinations of different people that C67 [Rodriguez] knew in real life, but Karaz was so special, he needed his own character,” Rosario said. When Karaz wasn’t busy with hip-hop, he was busy being an outstanding brother to his family — and his friends. Karaz’s nephew, Tyrese Wyatt, only just recently learned that his uncle was such an influence in Philly’s graffiti and hip-hop culture. “I really had no idea. I knew he was into graffiti because he was constantly drawing and our basement is full of his deejay equipment, but he was so humble,” Wyatt said. “I just knew him as my uncle that was always in a good mood, I never knew anything about Station Zero or how much of a pioneer he was. I can’t believe he really did all that and was never a show-off about it. Though Rosario knew Karaz the artist, he also counted him as a lifelong friend. “You know, all of us in our crew grew up and we moved on. C67 got into producing, I did some acting, you know how it goes. But Karaz would always call to keep in touch. He really cared about us,” Rosario said.